At first, I didn't know if it was worth it to write an article about my stay in Norway, as it was a 10-day short traveling experience with nothing else in mind than Aurora hunting... But anyway, I will still give some basic information about this beautiful country. Next day is a bit clearer, and I decide to walk around to the next village called Sørvågen as pretty as Å. After 2 days and still no aurora, I decided to leave the tranquility of this region and head down to Svolvaer, the main city in the area. The road to there, road E10, this time in dim daylight, is purely amazing, We pass through little towns like Reine, Flakstad, Leknes again and Bostad, before finally arriving in Svolvaer. Following the advice that I discovered afterwards, I found a little shop selling smoked salmon sandwich and a dessert called Svele, pure bliss! Then when night came, I went to an ice bar to enjoy a drink in a literally freezing place, which was rather an experience. Unfortunately, still no aurora... So the next day, I take the bus to go back to Evenes airport, and the road between Svolvaer and Narvik doesn't disappoint. I arrive at Tromso, and take a taxi crossing this fairly pretty city from the airport to the ferry port to embark in the Hurtigruten ferry MS Polarlys. Once the city lights are gone, I take myself to the cold front of the ferry, and yes, here it is, a nice and not-very-intense-but-still-pretty-good-for-a-first-time-with-a-camera aurora! Once the personnel of the ferry announces the Northern Lights, flocks of people join me in this experience, and as I had enough pictures for a first time, I went back to the warmth inside and enjoy my very comfortable bed. The next day, we arrive at Honnigsvad, small fishing village with an industrial port, and for which the only touristic interest is its proximity with Nordkapp. Also, the northern lights. Yes, as soon as I arrived there and for the time I remained, the sky was clear enough to enjoy auroras every night. The next day (yes, the days are short in winter, here), I decide to get infos on how to go to Cape North. Attention, in winter, buses only go once a day at midday, and only in weekdays, not during the week end. So I was pretty lucky to be able to enjoy it, as I spotted the bus on my way to the Information Center and decided to go for it. There's only 2 passengers in the bus, a japanese backpacker and me, and the wind is getting worse. But for the charming bus driver, it's just routine. After 20 kms, we wait for the Hurtigruten bus (as a day excursion for its passengers) to join us and a snowplow opens the road for us for the remaining 10 kms. As the night is rapidly growing, there's just enough time to take a picture of the "Children of the World" monument before returning to the warmth of the Tourist Center, offering a mini museum celebrating the opening of the center by the King of Thailand (!) and a poetic 14-min movie celebrating with no words but traditional music the beauties of the region in every season. Saturday is a dead day in Norway, and most of all in Honngsvag. The wind is growing even stronger, and I try to find a protected place to take pictures of the northern lights at their best. Once the night has come, which doesn't take long, I set for my protected place, and some time after that, I finally see the most amazing aurora so far. Mother Nature at its best. 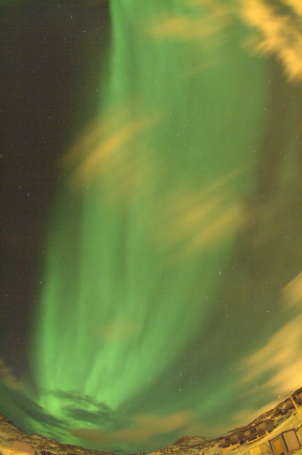 I can actually see the solar wind moving and undulating, it's purely magical. The next morning, waking up early to take the ferry to Tromso, the wind is good enough for the boat to stop at the harbour and take on its passengers. The day is boring on the boat, but the food is delicious. Arriving at Tromso at midnight I need a hotel room for 4h because Tromso Airport is not big enough to stay open during the night, and the Rica hotel right next to the harbour is very handy and comfortable (and the delicious receptionist offers me half price for the room). After the plane the next day, I arrive in Oslo and take the train from the airport for a day tour around the capital city. Quickly put, because I only had a few hours, the Opera is modern but a bit tasteless, the City Hall is just dreadful, but the wharf looks nice. Spikersuppa, the place behind the City Hall, has nice buildings around, and an interesting Christmas market, with an ice-skating ring, and stands offering deer burgers, smoked whale and one last treat of brown cheese vaffel, before heading back to the station via Karl Johans Gate.